The Sainte Chapelle is open daily from 9.00 to 19.00 from April to September. The Sainte Chapelle closes at 17.00 from November to March and at 16.00 on the 24 and 31 December (last entrance is at 15.15). Last admissions are usually 30 minutes prior to closing time. To avoid the busiest period visit before 11.00 or after 15.00. We are comparing Sainte Chapelle Skip the Line Tickets Prices from leading ticket suppliers and Try to find you Cheap tickets prices on the market. Although it is widely known as a religious building, the Sainte Chapelle was originally the centre of Parisian politics and the home of the French kings. In the 14century this mediaeval palace was converted into a Christian Chapelle and since then it’s had a special place in the heart of Parisians. History and stories are in abundance inside this gothic construction, some of the tales you can see painted in the vibrant stained-glass windows others are told in sacred text. The Sainte Chapelle is said to house the very Crown of Thorns that Christ himself wore, as well as other ancient relics of the city and its monarchy. For people interested in 13-century architecture, gothic architecture and religious sites then a visit to the Sainte Chapple should be top on your list of things to do in Paris. The skip the line tickets will be convenient for people with limited time in the city (i.e. those on a city break or stopover), and anyone who wants to have more time to explore the interior. Great for international travellers as the free booklet is available in 11 languages and recommended for those who prefer to visit the site without a tour guide. Your Experience With Sainte Chapelle Skip the Line Tickets? Skip the queues and visit this famous royal chapel at your own pace. Take in the imposing gothic architecture, the fine artworks and intricate sculptures. Soak in the multicoloured light of the stained-glass windows. Learn the history of this 13century chapel with a handy visitor’s booklet. 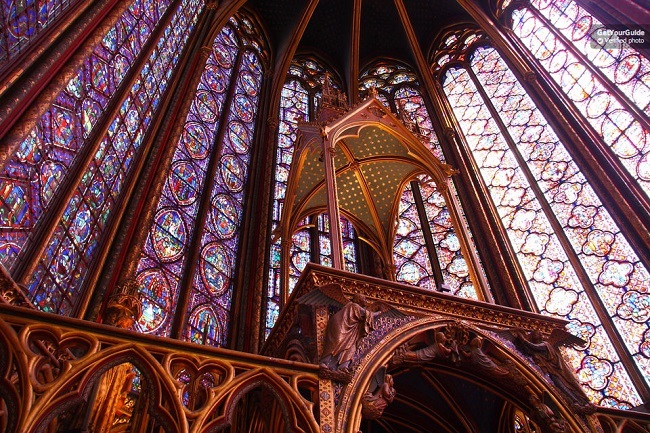 What Sainte Chapelle Skip the Line Tickets Includes? Skip the line entrance to the Sainte Chapelle. Complimentary visitor booklet, available in English, French, Spanish, Italian, Portuguese, Dutch, German, Russian, Polish, Japanese, and Chinese. The Towers of Notre Dame (if selected). If you are interested in religious sites and architecture then we recommend booking the combo version of this tour with Viator. You will have the benefit of an expert tour guide and also visit the Towers of Norte Dam. Travelers Reviews about Sainte Chapelle Skip the Line Tickets? The Sainte Chapelle is one of the most-visited places in Paris. It has an impressive 4.5 out of 5 rating from over 21,000 traveller’s ratings on TripAdvisor. Likewise, the skip the line entry tickets have a 4.7 out of 5 rating from customers on Get Your Guide. Reviews have said that the Chapelle is beautiful and stunning and that it is worth a visit just for the city views from the tower. The many positive reviews imply that the pre-booked priority entrance tickets are worthwhile and recommended. The Sainte Chapelle is not suitable for wheelchair users. Depending on your tour provider your tickets may be fully refundable up to 24 hours in advance, however certain providers will require more cancellation notice so please check the cancellation policy before buying your ticket. Tickets from some providers are not refundable. Tickets are accepted at the entrance in mobile or printed form. You will receive your tickets via email within 24 hours of making your booking. Your ticket can be used at any time on your selected date. There are mandatory security checks at the entrance to the Sainte Chapelle, you will not be permitted to take any sharp objects inside. There is no cloakroom/luggage storage at the Sainte Chapelle so avoid bringing large bags (bigger than 20x40x40 cm) as you will not be able to take them inside. A dress code applies; visitors should wear clothing which is appropriate for a place of worship (i.e. No vests or shorts/skirts above the knee). If you are not suitably dressed then you may not be permitted to enter. Entrance is free for visitors under the age of 18 and for EU citizens (with valid ID) under the age of 26. Meeting Point: go to the entrance of the Sainte Chapelle, 8, Boulevard du Palais, 75001, Paris. Bus: You can take the Balabus or the regular city buses (lines 21, 27, 38, 85, or 96).